The tent survived the windy night - most likely due to the fact that the trees around us offered a reasonable amount of shelter. Again it promised to be a fine day - no rain as yet - and after cooking up some porridge for breakfast, we headed back down to the Weasel. It would have been great to have walked up to the Torres again - the sun would have been in a much better position for photos - but we were both pretty tired, and thinking about our rather fully itinerary over the next few days, we couldn't quite summon up the energy to climb back up the steep rocky slope. 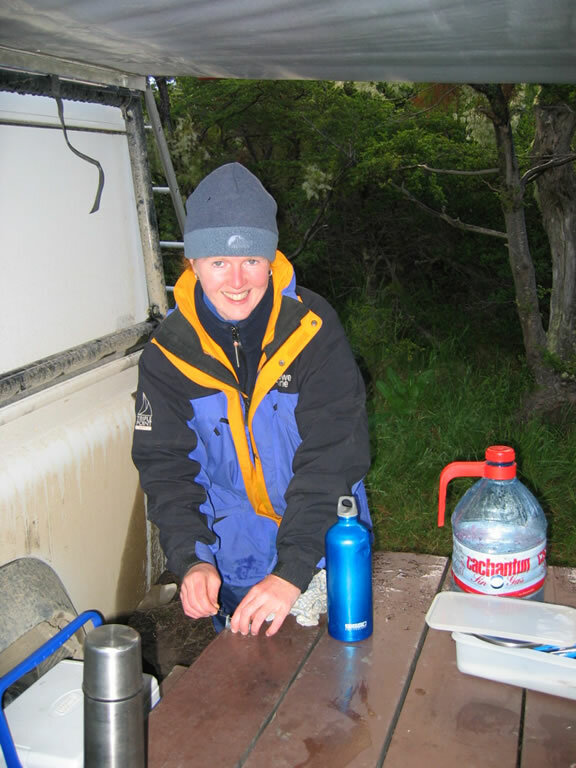 We packed up the tent etc and made quite fast progress back down to the Campsite Las Torres. We stopped again at the Chilean Refuge for a hot cup of tea and to stock up on more water and an hour later we were back with the landy. The sky was still fairly clear and as we headed off towards Lago Pehoe, the views along the way were fantastic, especially with the Cuernos in the distance. Again we stopped frequently to take photos and just soak up the views. Camping Pehoe was our final stop that day. From there it would be about a 10 minute drive to the ferry stop where we would cross the Lago Pehoe the next day. The campsite turned out to be one of our more expensive campsites at 8,000 Pesos each a night, but the showers were very clean and hot and the views were well worth it. 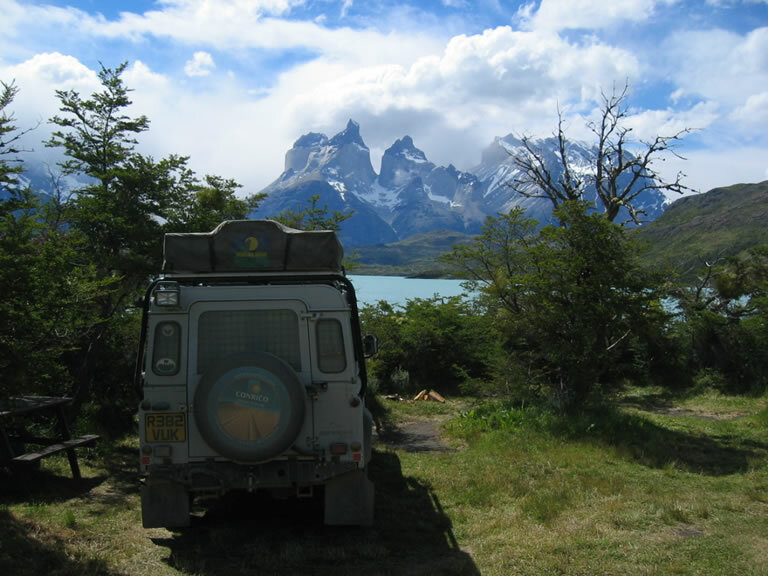 We parked the Weasel up with the Cuernos forming the backdrop to our site, and a few steps away from the lakeshore. Desperate for a shower we cleaned up only to be greeted five minutes later by a light drizzle of rain. Cooking dinner was going to be fun! While we waited to see if the rain would let up, Sue went off in search of some bread from the little convenience shop on the site (the bread tended to go stale quite quickly so it was pointless buying in bulk). Unfortunately they had run out and wouldn't be getting any more until the next day - possibly. Luckily a guide from one of the tour groups also camping there overheard Sue conversation and gave us a bag of rolls from their provisions - he said they had more than enough spare. That would keep us going at least until lunch the next day. The other group camping that night was the Dragoman truck we kept bumping into. We caught up with a couple of the people in the group later that night, but most of the original ones we had met in Peru had now left the tour and had headed home. 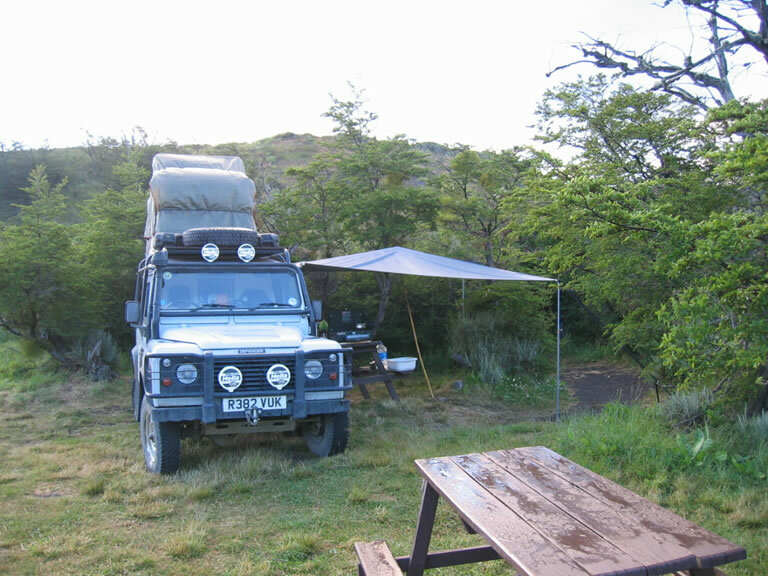 After watching a great sunset going behind the Cuernos, we headed off up to the roof tent for a welcome sleep. The matress felt so much better than the kip mats we slept on the night before.